You are currently browsing the tag archive for the ‘Picture Book of Animals’ tag. This is a quick post as I go into hospital for a long-awaited cataract operation on Tuesday morning and will not be out until Thursday. 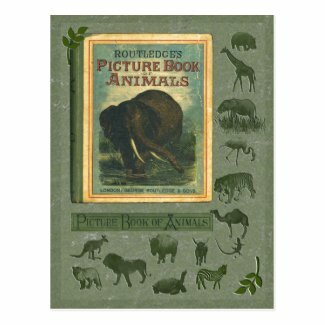 This design, which has just sold on a postcard, incorporates the cover of a vintage volume on my shelves of Routledge’s Picture Book of Animals. All the embossed creatures are my addition. It’s the first sale and I’m rather pleased.